The men of Odysseus are rowing with all their strength while the ship is pitching in rough seas. The blinded Cyclops tries to feel for the fugitives. Battle-tried, Odysseus raises his sword. 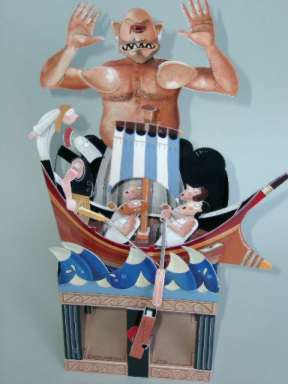 Newstead's model is part of a children's book about the Odyssey. The book includes 16 pages with text and 4 pages with instructions. The construction sheets are stitched in the middle of the book.